Burundi is one of the poorest and least developed countries in the world, and is still recovering from its many years of civil war. Countless challenges remain. 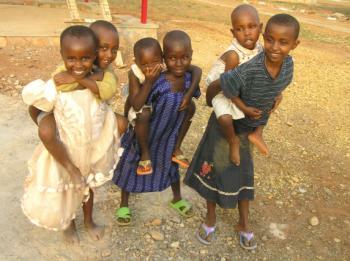 SOS Children’s Villages has been helping vulnerable children in Cibitoke since 2009. Today, children need our support as much as ever. Cibitoke, capital of the province of the same name, is located in the north-west of the country and was hit the hardest by the state of crisis that began with the 1993 coup, leading to a violent civil war in the following years, and the on-going socio-political conflicts in the region. The region was marked by large numbers of victims, streams of refugees and internally displaced people, and the disintegration of the social and economic infrastructure. At the height of the conflict, in 1999, there were around 800,000 internally displaced people in the country, living mainly here in the north. As of 2011, there were still almost 80,000 people living in 120 settlements for the internally displaced in northern and central Burundi. Most of these people are extremely poor and do not own the land they were resettled on. Many lost all their possessions and the land they previously owned in their regions of origin. Many are still waiting for the government to decide whether they are to return, integrate locally or resettle elsewhere. Despite being predominantly rural, Cibitoke is one of the more densely populated provinces in the country, with six per cent of the nation’s population living here. The situation of children and young people in the region is extremely tough: just 67.3 per cent of children live with both of their parents; over nine per cent of children have been abandoned or separated from their parents. More than 30 per cent of women raise their children on their own and live in great poverty. Just 13 per cent of children are in a position to go to school. Especially in those areas hosting many internally displaced people, schools and health services are frequently overloaded and land access becomes increasingly competitive. As a consequence, food insecurity, lacking educational and social services, as well as the threat of measles and cholera outbreaks, continue to endanger the healthy development of children. The SOS Social Centre here, which also includes a medical centre, was opened with the aim of providing the people in the neighbourhood with medical care, informing them about preventative measures, providing troubled families with social and material assistance, and offering counselling in matters of education, parenting skills, and nutrition. The social centre also provides guidance on finding employment and generating an income to parents. In cooperation with local organisations, we work to strengthen families that are living in poverty so that children can grow up in a secure and loving home. Around 75 children from both the children’s village and the neighbourhood attend the SOS Kindergarten, ensuring that children from SOS families make friends and are integrated into the local community from a young age. The provision of day-care is particularly valued by parents who need to go out to work or look for a job during the day, as they can leave their children in safe hands. The children then go on to complete their primary education at the SOS Hermann Gmeiner School in Cibitoke, which is attended by over 230 pupils, making it a valuable educational institution in the region.